In my post yesterday (Keeping History Alive, Part 1: Family Photos), I described how I scanned my grandmother’s photos to preserve them and share them with all of my family members. 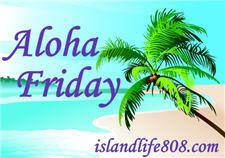 My Aloha Friday question for this week is: What have you done to preserve your old family photos? Have you scanned them? Have you cataloged who is in them? I haven’t done anything, which is might be shocking when you consider how big of a scrapbooker I am. Since my Grandma just died, it’s especially important that I get on that. We have a ton of family pictures, my Grandpa was an avid photographer and was even published in a Kodak manual. I know my Aunt has most of the albums. .-= Katie´s last blog ..Come Join Me on BlogFrog & Exciting News =-. Anything, I think need to think on this more. Happy day and enjoy the weekend. I scrapbook, but all the older pictures are just in photo albums. If I think about doing something else with them, I’ll go nuts thinking about how long that will take! We don’t have many picture because most were ruined in a fire. The older ones are in photo albums and the newer pics are stored online and on a External Hard Drive. .-= 3 Cuzins @ Cuzinlogic´s last blog ..Aloha Friday #9/Friday Follow #7 =-. Hanging my head in shame, I have done nothing. I still have rolls of film from 10 years ago. SIGH. .-= Jennifer´s last blog ..Book Tour & Review: Hiking Through by Paul V. Stutzman =-. Hmmm…still working on this one. It’s an important priority that I haven’t taken the time to complete. .-= Simply Cathi´s last blog ..The Ultimate Blog Party – Giveaway =-. I do a lot of scrapbooking and I have done some scanning but not on a major scale. My mother has all the “older” photo albums so I am sure I will eventually get some and I will try my best to preserve the photos. It’s a great thing to do. I scanned them and made them into a book for my mother through SHUTTERFLY.com. THey make great book. SO far I’ve made 3! .-= Night Owl Mama´s last blog ..WW: Mini Motorcyle Baby =-. I have started to scan them. This summer I will set some time aside to get them all downe and put them on a Picture stick. .-= Auntie E´s last blog ..Friday follows & Aloha fridays- Jelly Fish travel? =-. .-= Boxing News and Updates´s last blog ..Antonio Margarito as one of the Champ’s Short List =-. I’m lucky if I even know which safe storage spot I put them in. .-= Harriet´s last blog ..Ever wonder if Super-Mom Kate has ever hit a rut? =-. My nan has photo albums of pics when she was younger, whioch i think my Mum has now. I just have the one old photo from my Nan and Grandad’s wedding, which I keep meaning to get enlarged. .-= Rach´s last blog ..Aloha Friday #129 =-. I’m sorry to hear about your photos. Of course, that’s another reason to scan them and share them with family. If something were to happen to the originals (fire, theft, etc), the scanned copies would be safe in multiple locations. It’s also a good idea to store them online or have a copy of them on an “offsite” external hard drive for the same reason. The time commitment didn’t scare me so I went with doing it myself. If you can’t devote the time to it and mailing your photos doesn’t scare you, I’d recommend one of the photo scanning services I mentioned in the blog post. They aren’t too pricey and can do the job faster than you can. I actually found old pics negatives from my hubs family they lost after his mom died so I had them developed and made an album for hubs and his brother. I also scanned lots of them and made B & W picture wall in our living room. I love old photos. .-= Bibi´s last blog ..Aloha Friday #5 & My Schnitzel Story =-. I don’t have any old family photos. The orphanage has my history. .-= JamericanSpice´s last blog ..Ultimate Blog Party 2010 – Apr 9-16 @5M4M – Win lots of prizes! =-.